Congratulations to Past President and District Governor Ernestine Luise and future President Tom Wilson on being named recipients of Gold Seal Awards from the Greater Valley Chamber of Commerce. Ernie received the Chamber’s highest award – Platinum and Tom received one of the three Gold Awards. 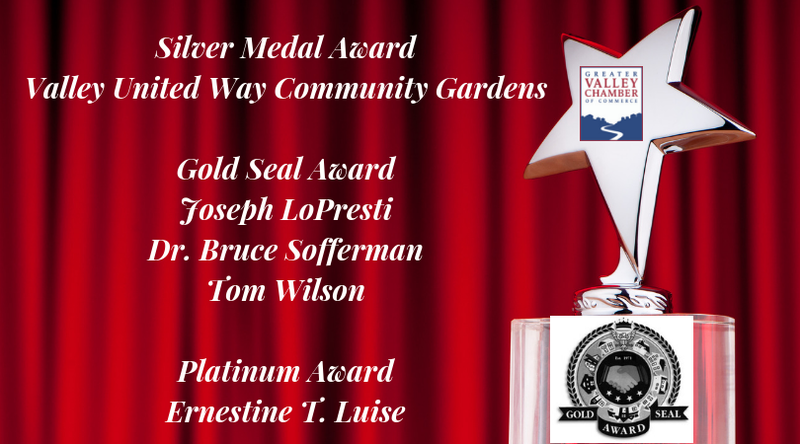 In addition, the Derby-Shelton Rotary Club had an indirect tie with this year’s Silver winner – Valley United Way’s Community Gardens. Years ago when that program was just getting started the Club co-funded the program with United Way. This year’s awards were presented on October 25 at the Awards Reception at Center Stage Theater in Shelton.